The word “Viking” means “a pirate raid” in the old Norse language. Vikings – even though they called Scandinavia their home, these Ancient Norse sea experts did everything from exploring, trading, colonizing, and looting. During their time, they instilled fear in most of Europe, and even parts of the middle east. With the surprising extent of their influence, it’s no wonder they remain notorious to this day for the mark they left! 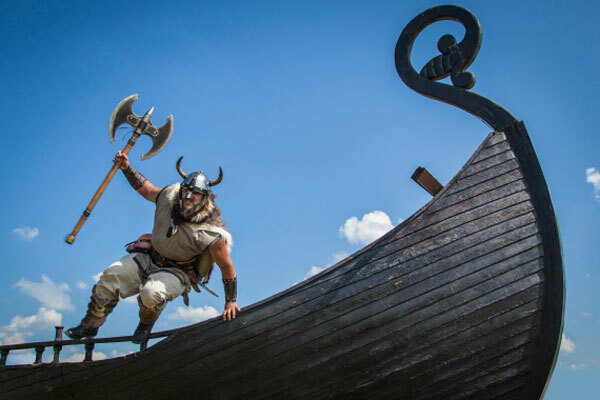 Check out these 30 unbelievable facts about Vikings that will shock you! 2. The word “Viking” means “a pirate raid” in the old Norse language. 3. The age of the Vikings lasted for just under 300 years between 900 A.D. and 1066. 4. Vikings have been known to have fantastic hygiene. Archaeologists have found tweezers, razors, combs, and even ear cleaners at excavations sits. Vikings bathed at least once a week which is more frequent that other Europeans of their time. 5. Due to the Norse religion, it was believed that warriors went to incredible realms after their death, therefore burying their dead in boats was common to help reach the afterlife. In the boats, the dead were often sent off with their weapons, jewelry, and sometimes even sacrificed slaves. 6. Primitive skis were developed 6,000 years ago by Scandinavians. By the time of the Vikings, the Norse used skiing as an effective method of travel, as well as for fun. They even had a god of skiing, Ullr. 7. The majority of Vikings spent their time farming barley, rye, oats, as well as raising cattle, goats, pigs, and sheep on farms just big enough to support their family. 8. Due to the beauty ideals of Norse culture, brunette Vikings (often men) would bleach their hair. These treatments also helped with head lice! 9. The Vikings never called themselves Vikings and they did not think of themselves as a united group. They were a series of chieftain-led tribes that fought against each other throughout Denmark, Sweden, and Norway. 10. The Vikings practiced Norse Paganism, the head of their gods was Odin and Thor. It was thought by the Vikings that if they die in battle that Odin could choose them to bring to Valhalla – their version of Heaven where only the legendary Norse heroes go. 11. 500 years before Christopher Columbus “found” the shores of America, the Vikings landed on what is now Canada in around A.D. 1000. 12. Compared to other cultures, Viking women had more rights than most women. Viking women had the right to divorce their husbands and inherit property. 13. It’s difficult to gather information about the Vikings, because they never wrote down their own history. Most of what is known about Viking raids and customs comes from what their enemies documented about them. 14. There were four major classes of Nordic societies: Kings, Jarls, Karls, and Thralls. Kings were the rulers, Jarls were the noblemen, Karls were the farmers, tradesmen, and builders, while the thralls were the slave class. 15. Vikings who would go into battle in a trance-like state of rage were called berserkers. It was said that they often wore bear or wolf skins into battle. 16. 20% of English words are derived from Old Norse. Some of these include anger, ugly, weak, skull, and slaughter. 17. Some of the Vikings kept pets – from cats, dogs, falcons, peacocks, and bears. Bear cubs would be caught as cubs and then raised by Viking families. Polar bears, however, were reserved for noblemen only. 18. Only 80% of Viking children survived past 5 years old. If a child was sick or weakly, the parents would either abandon the child of throw them in the sea. This was due to the strong pride Vikings took in strength and power. 19. There is a remote valley in Sweden where an ancient Viking dialect of Old Norse is still spoken. 20. The Bluetooth symbol is an old Viking rune – they represent the initials of a Viking King. 21. Greenland was discovered by the Vikings centuries before the Inuit arrived. However, when the Inuit started moving south, they attacked and collapsed the Norse settlements. 22. There was an ancient Viking King who took Christmas so seriously, that his subjects were forced to drink ale throughout the holidays. Anyone who didn’t was fined. 24. One of the Viking kings once ruled as the King of England for 5 weeks. 25. In order to tell how bad a battle wound was, Viking women would feed an injured warrior a broth with potent onions. After eating it, if they could smell the broth through the wound, they knew it was too deep and there was no way to fix it. 26. The most prized weapons of the Vikings were their long swords. They would often name their swords things like “Widow-Maker” and “Corpse-Bramble.” The swords would often be passed down through the generations. 27. The Vikings are notorious for their impressive boat building skills for their time. They invented the keel, as well as central spines down the underside of the boat to make the vessel more stable. 29. Poetry was thought to be a gift from Odin. The Vikings ultimately invented rap battle during the 5th Known as “flyting,” it is a poetic exchange of insults often targeting cowardice or perversion. 30. The national sport of Iceland is Glíma, which is a Scandinavian martial art used by Vikings.